Banana Cupcakes with Peanut Butter Cream Cheese Frosting, made from scratch! An easy recipe that’s simple and scrumptious! There are few things I love more than a simple delicious cupcake, made from scratch! Even better is one that reminds me of my childhood days snacking on bananas slathered with peanut butter! 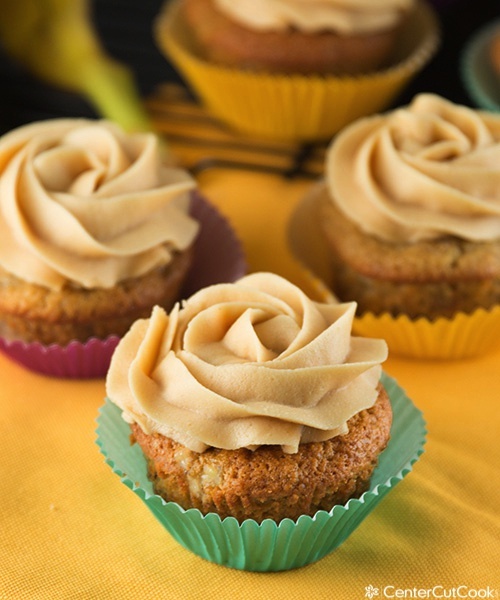 The Banana Cupcake with Peanut Butter Cream Cheese Frosting is the latest cupcake concoction to come out of my kitchen. After one bite, you’ll quickly learn that it might be difficult to keep your cupcake consumption in check. 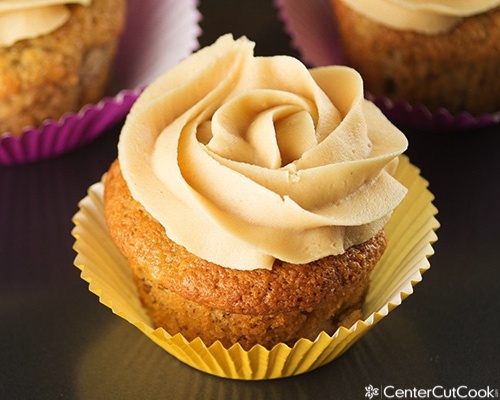 These Banana Bread Cupcakes are awesome! As I was pondering the thought of a banana cupcake, I debated long and hard about the frosting choice. Options that came to mind consisted of things like – plain cream cheese frosting, maple cinnamon frosting, or peanut butter frosting. Eventually I decided a peanut butter cream cheese frosting, the one I use on my chocolate peanut butter cupcakes, would suit these banana cupcakes perfectly! While it is made from scratch, it comes together quick. All you need is a mixer! These cute little cupcakes remind me of banana bread, which I adore! I’m a sucker for all things banana bread whether it be muffins, bread, or cupcakes! The only possible way I could see changing up this recipe in the future might be to add chocolate chips since I am in serious l-o-v-e with this chocolate chip banana bread. I was able to get about 15 cupcakes from one batch. When you have a situation where you don’t fill a whole muffin tin, it’s best to put a bit of water in each empty muffin cup to ensure even baking. Be sure to let the cupcakes cool completely before frosting them, otherwise the frosting will start to melt on the cupcake. If you’ve never decorated a cupcake before, I’d recommend starting with this simple 12 piece cupcake Decorating Set from Wilton. I bought this kit at Target years ago, and it’s all I use these days. It’s got everything you’d need to take your cupcakes up a notch. 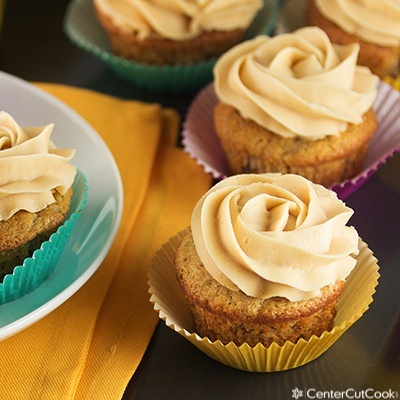 A match made in heaven, these Banana Bread Cupcakes paired with Peanut Butter Cream Cheese Frosting are sure to be a new favorite in your house. Enjoy! Pre-heat your oven to 350 degrees and prepare a muffin tin by lining it with paper liners. With your mixer, cream together butter and sugar until light and fluffy. Add in eggs one at a time, and vanilla and mix to combine. Add in sour cream and bananas and mix again, making sure to scrape down the sides of the bowl to ensure everything is getting mixed well. In a large bowl sift together flour, baking soda, cinnamon, nutmeg, and salt. Slowly add the dry ingredients to the wet and mix until smooth. Fill each muffin cup about 3/4 of the way full. You should get about 15 cupcakes from one batch. Bake for about 18-20 minutes, or until a toothpick inserted into the center of the cupcakes comes out clean. Allow the cupcakes to cool for a few minutes before transferring them to a wire rack to cool completely. While the cupcakes cool, make the frosting. With your mixer, combine cream cheese and butter until light and fluffy. Add in powdered sugar, one cup at a time. 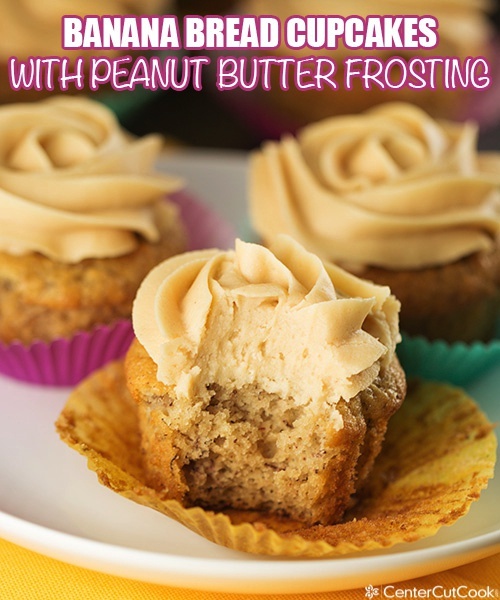 When all of the powdered sugar has been added and the frosting is light and fluffy, add in 2/3 cup creamy peanut butter and mix to combine. Pipe frosting onto cooled cupcakes. Store in an air-tight container.